The old timers here in south Georgia always would say to plant potatoes on Valentine’s Day, and that’s what I did when I started gardening years ago. One year I happened to be running a little behind and got them planted at the end of February. I have found this works best for me. If we have a warm February, the 14th would work fine, but generally my potatoes perform best when planted at the end of the month. I plant the Red Pontiac (also known as Dakota Chief) variety which is the old standby favorite. They are affordable and they grow well and store well in our southern climate. Last year I experimented with fingerling potatoes. There has been a lot of hype over them the last few years and the seed potatoes can be quite expensive. I found some that had started sprouting in SAMs that were intended to be sold as fresh eating potatoes and they were marked down 1/2 price. It was a variety pack with different colored fingerling potatoes, so I planted them. They turned out to be outstanding and one of my new favorites! The texture was different and they cook faster (being smaller). If the seed potatoes were more readily available and less expensive, I would plant more. If you get a chance to grow them, you won’t regret it. The Hoss Wheel Hoe makes planting potatoes easy. Using the left and right plow attachments, the wheel hoe can be set up as a furrower and a hiller. 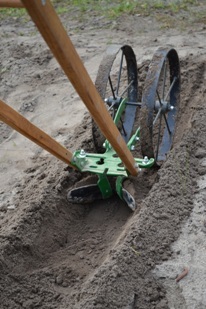 To create a furrow, simply attach the plows to the tool bar of the wheel hoe facing outward. Once planted, the potatoes can be covered by turning the plows on the tool bar inward so they serve as a hiller. 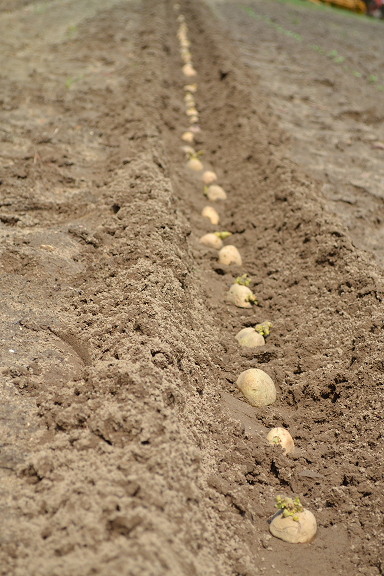 Seed spacing recommendations for potatoes range from 10″ to 24″. However, in my garden I plant on 8″ spacing as I have found my potatoes to be most productive on closer spacing. I cut them up a few days before I intend to plant them (to give them time to heal) and always plant the sprout facing upwards. Always plant your potatoes in a different spot in the garden every year as the rotation helps with disease control.